Onslaught was first created in X-Men #25 when Professor Charles Xavier mindwiped Magneto after he had pulled all the metal adamantium out of Wolverine's skeleton. A small amount of evil psyche slipped into Xavier's mind. 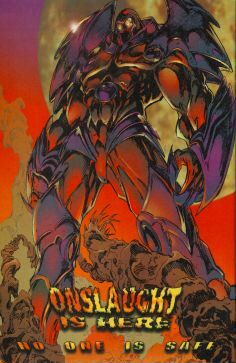 This evil later manifested itself in the astral plane and became the most powerful telapathic force in the world, Onslaught. 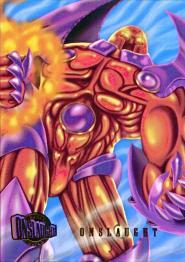 Onslaught is a pure being of psionic energy and has almost limitless power. 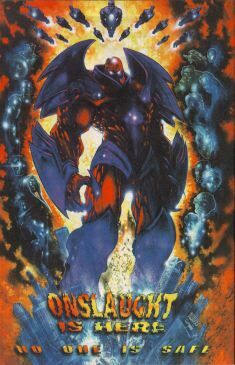 Onslaught made several cameo appearences such as in X-Man #15 recruiting lackeys. In X-Men #50 he sent his goon Post against the X-Men. In Uncanny X-Men #322 Onslaught punched Juggernaut from Canada to New Jersey. The X-Men took Juggernaut in and tended to his wounds. In X-Men #53 Onslaught pulled Jean Grey into the astral plane and tried to convince her that he was doing the right thing by trying to destroy humankind. After this she went to Juggernaut and together they discovered that Onslaught was no other than the founder and leader of the X-Men, Charles Xavier! 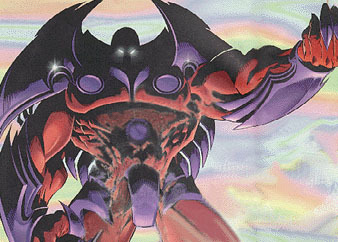 This being defeated the X-Men in Onslaught: X-Men and took the Dark Beast under his wing. Onslaught then used the robotic sentinels to take Manhatten. With a combined effort from the X-Men, Avengers, Fantastic Four, and all Earth's other heroes the sentinels were defeated. 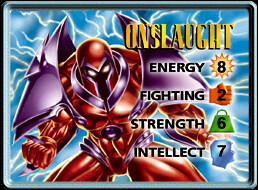 In Onslaught: Marvel Universe the heroes all faced Onslaught. The combined efforts of the Vision and Rogue were able to penetrate his psionic shiled, and the Hulk cracked Onslaught's armor with help from Jean Grey. All that was left was a pure energy being. The Avengers and Fantastic Four lept into this being and were reborn in another universe, but their great sacrifice destroyed Onslaught and saved the Marvel universe. Proffesor Xavier was left powerless and was eventualy imprisoned. The rest of the New York was trying to rebuild itself after this incident, but ran into some problems. The former Masters of Evil were rejoined by Baron Zemo (now calling himself Citizen V) and fooled the world into thinking they were superheroes. The master of illusion Mysterio and the Fenris twins were others who tried to cash in on the city's problems. As for the X-Men, they were safe until a new threat hit mutantkind, Operation: Zero Tolerance, led by the maniacal sentinel/humanoid Bastion, a combination of Nimrod and Mastermold. To learn more about the origin of Onslaught, check out Marvel Annual 98: Featuring X-Men & Dr. Doom, which shows Dr. Doom going to key times in the past, present, and future of the X-Men, Magneto, and of course, Onslaught.